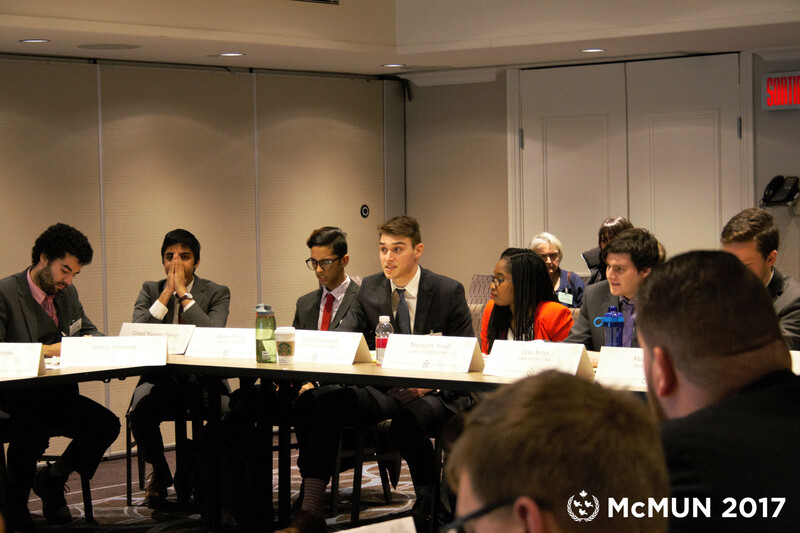 The McGill Model United Nations Environmental Assembly gathered and discussed global environmental policy as one of the most pressing matters regarding the future of human health and ecological sustainability. Delegates representing a vast amount of nations formed partnerships in the assembly to address current issues critical to the global environment, as well as present proposals that would lead towards a brighter environmental, economic, and ecological future on an international basis. While the discussions and proposals focused predominately on the aiding of developing countries on their route towards cleaner energy resources, the delegates also discussed the effects of climate change and how all nations must work together on a global basis to develop energy resources that will safeguard the future of the environment. One of the largest proposals was the Green PEA Initiative, a motion that concentrates on renewable energy resources for developing countries, and emphasizes that nations have the right to decide for themselves (in terms of solutions for cleaner energy) which methods would be the best for them, on the basis that each country has different issues regarding environment and ecology. One of the most important proposals was the Green PEA Initiative, which is a motion that concentrates on exploiting renewable energy resources for developing nations. The Initiative emphasizes that nations have the right to enact country-specific clean energy solutions and legislation, a conclusion which is predicated upon the basis that each country faces different environmental and ecological issues. All in all, the document supports sustainable energy and the tailoring of energy resources to fit each developing nation, as no two nations are the same. In terms of evolving climate change, the assembly weighed in on the pros and cons of different energy resources. Many countries had differing views on sustainable energy, which includes nuclear energy, versus renewable energy, which refers to solar and hydropower solutions. While the Green PEA Initiative supported the development of sustainable energy based on a country’s energy needs, another large proposal called the ACE Paper favoured renewable energy, citing economic implications as a reason to forgo sustainable energy sources. Despite said division, it was unanimous among the delegates that environmentally friendly energy generation in developing countries is a priority and aiding those countries on the discussed issues is a step in the right direction for the improvement of international environmental sustainability. The McMUN Environmental Assembly brought to attention that the present and ongoing issues of climate change and environmental problems are a matter of international concern. While different issues may pertain to different nations, the preservation of global habitats through cleaner energy resources is an affair that involves nations working together in search of improvements, and perhaps solutions, for a greener, healthier future for all.